Tucson -- A group of Arizona LGBT Democrats has announced endorsements for the Aug. 26 state Primary election. 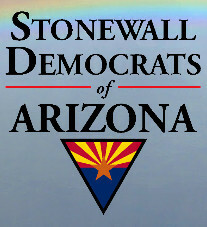 The Arizona Stonewall Democrats formed earlier this year after the group was dormant for a couple of years, according to Robert Rowley, of Tucson, leader of the group. He said the group of about 50 members registered as a political action committee in April. Rowley said Stonewall Democrats made its endorsements after scoring an equality survey that was sent to all the candidates seeking election. In a few races, the endorsements by the Stonewall Democrats were different from endorsements made earlier by Equality Arizona, a statewide LGBT human rights group. A notable difference was in the District 24 House race in central Phoenix, where Stonewall endorsed Ken Clark rather than Rich Bauer, Equality Arizona's choice.